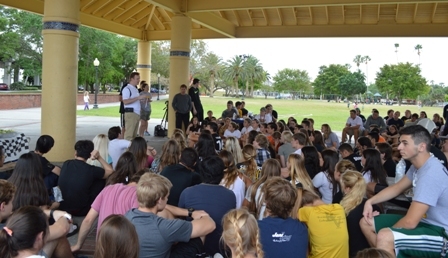 The Class of 2016 began their freshman year with Freshman Retreat, a retreat designed to introduce and welcome our newest students to Bishop Verot. Service to the community was a large part of this first retreat, and continued to be a primary focus, as they met or exceeded the Christian Service requirements each year. What better way to bring our seniors time here to a close than by once again, going out into the community together to make a difference. On Senior Service Day, our seniors went to the Harry Chapin Food Bank, Special Equestrians, Special Populations, LARC, the Salvation Army, and Second Act Thrift Store, to help with food sorting, yard and barn work, cleaning of equipment, and many other needed chores. When the work was done, the students gathered downtown for prayer and lunch. Fr. O'Madagain shared with the students words of encouragment for their future, praying for them to always help those in need.